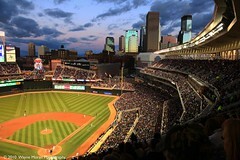 This shot was captured at the Minnesota Twins stadium known as Target Field in Minneapolis Minnesota. This was a great win for Matt Fox's professional Baseball debut. As Tim would say, “this is quality of life my boys, quality of life.” Thanks Tim and Pat. All of my work is copyrighted by Wayne Moran Photography. Any and all theft will be prosecuted to the fullest extent of the law. Signes prints are for sale, just go here. This entry was posted in Art, Cultural Commentary, Games, Photography, Travel, Web/Tech, Weblogs and tagged Target Field : Minnesota Twins Stadium Target Field Matt Fox Professional Debut. Bookmark the permalink.